The OHAUS Moisture Analyzer Principle PDF Guide discusses moisture analyzer principles and is a great tool to assist you in choosing the right instrument. Speed, Simplicity and Affordability The OHAUS MB23 basic moisture analyzer combines high quality and durable construction into a sleek, compact design. The MB23 offers dependable, accurate, results f.. Speed, Simplicity and Affordability The OHAUS MB25 basic moisture analyzer combines high quality and durable construction into a sleek, compact design. The MB25 offers dependable, accurate, results f.. Combining Speed and Precision in One Moisture Analyzer - Test More Samples in Less Time Measuring moisture content has never been easier than with the MB90 Moisture Analyzer. 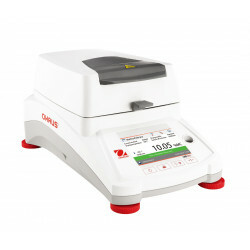 The MB90's halogen heati..
Moisture analysis made simple and powerful The OHAUS MB120 moisture analyzer delivers functionality and precision that you can rely on, and is easy to operate and clean – you can test more samples in..